If you, like just about everyone today, own a TV, it’s crucial to have a TV stand. Without one, your TV is left to sit on the floor, at an uncomfortable viewing height. Even if you’re wall mounting your TV, you’ll still need a place to put your cable box, video game consoles, and DVD or Blu-ray player. All this means a TV stand is an essential piece of furniture. But you don’t have to spend a fortune to get a high quality TV stand. In this article, we’ll take a look at some of the best cheap TV stands. We’ll also examine some options for finding affordable TV stands online and in your area. This Convenience Concepts Designs2Go TV stand is simple and affordable. If you’re looking for a basic TV stand that will hold all the consoles and devices you own, this is a great option. 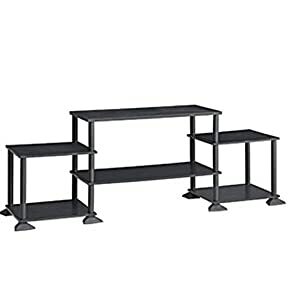 This cheap TV stand has 3 shelves—the top one is for your TV, and the other two leave room for your cable box and other items. Simple, sleek metal poles connect the three tiers, leaving an open design. The only downfall of this design is that it’s hard to hide wires and cables. The shelves themselves are made of laminate fiberboard. This material looks like wood, and it even has a wood-grain design, but is much lighter and far less expensive. You can choose from a variety of colors—this TV stand is available in black, cherry, espresso, light oak, and white. You may have problems with this TV stand if you own a larger TV. At only 42 inches wide, this TV stand can’t hold a TV bigger than 42 inches. Still, for the incredibly low price, this cheap TV stand does the job. If you want the look of a wall-mounted flat screen TV, but still want a TV stand to hold all your AV components, the Whalen Furniture PROEC41-NV Flat Panel Television Console is an excellent and affordable option. This TV stand allows you to have your TV float above the rest of the TV stand and even has a swivel feature. The back of this cheap TV stand is where your TV will be mounted, while three shelves below provide space for other items. The back of the stand can swivel up to 45 degrees, allowing you to easily adjust the angle of your TV to get the ideal viewing angle. This allows you more flexibility in where you place the TV stand, too. The back, or spine, of this stand also has space to hide cables and wires, creating a cleaner look. The three shelves are open, so there’s no room to hide extra DVDs or video games. There is plenty of space, however, for your cable box, DVD or Blu-ray player, and video game consoles. The shelves on this TV stand are made of glass, giving it a sleek, modern look. The only disadvantage to these glass shelves is that they will show dust and fingerprints easily, so you may want to clean your TV stand more often. The spine is made of a dark-colored wood. Unfortunately, there are no other color options if this doesn’t match your décor. This cheap TV stand can hold a flat screen TV up to 47 inches, which is a pretty sizeable television. Overall, this is a great, affordable TV stand for those who like the wall-mounted look and don’t need a ton of hidden storage space. 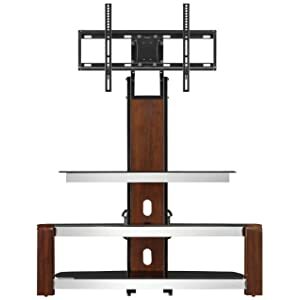 If you have a small TV and you’re looking for a budget TV stand to hold it, look no farther than this Convenience Concepts Designs2Go 3-Tier TV Stand. This TV stand is designed much like the first Convenience Concepts Designs2Go TV stand we looked at, but it is meant for a smaller TV. 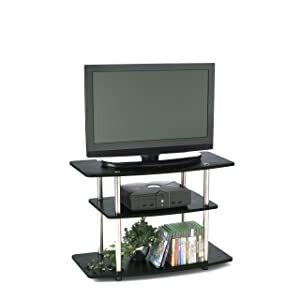 With a tall and narrow design, this TV stand is perfect for a small apartment or even a dorm room with limited space. 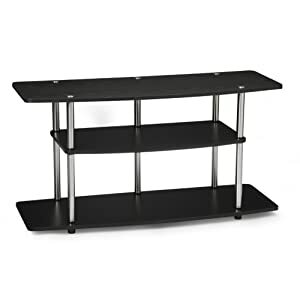 There are three shelves, with the top one being for your TV and the other two open for a cable box, DVD or Blu-ray player, video game console, or anything else you want to keep on your TV stand. Like Convenience Concepts Designs2Go’s other TV stand, this one doesn’t give you many options for hiding wires and cables. The open design allows room for the essentials, but you won’t get any additional storage space with this TV stand. All three shelves are made of laminate fiberboard, which is light and inexpensive, but have the look of real wood thanks to the wood grain design. This cheap TV stand comes in three color options—black, brown, and espresso. Unfortunately, there are no lighter-colored options for this particular TV stand. Another downfall to this TV stand is its smaller size. While it’s ideal for small spaces, it means that this cheap TV stand can only hold a TV up to 32” or 80 pounds. Nevertheless, if you have a small TV, this TV stand is affordable and simple. This 3-cube Media Entertainment Center is a unique option for those looking for a modern-looking cheap TV stand. Unlike most TV stands, which are just one large unit, this budget TV stand is three units in one. It looks like a TV stand with two small side tables or nightstands attached to either side. Each of the three sections has two shelves, so there’s plenty of storage space with this TV stand. However, all sections are open, so there’s no room to hide clutter. One way to work around this would be to put storage bins or baskets in the side compartments, creating a hidden storage space. The center compartment is large enough to hold a flat screen TV up to 40” as well as any AV components, such as your cable box, DVD or Blu-ray player, and video game consoles. The shelves are made of wood composite, while the support poles are made of plastic. These materials, while inexpensive and lightweight, may not last quite as long as a more expensive model. 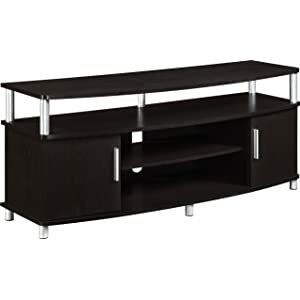 Considering the extremely low price of this cheap TV stand, it’s an excellent option for those who need more storage space but don’t want to break the bank buying a TV stand. The Altra Carson 50” TV Stand is a bit of an upgrade from the Convenience Concepts Designs2Go TV stand. This TV stand is larger, so it can hold a bigger TV and more consoles or other items. Additionally, this TV stand features two cabinet-like compartments on either side that are fully enclosed. This means you can hide items such as your DVD, Blu-ray, or video game collections. These compartments allow you to create a clutter-free look without breaking the bank. There are also two wide shelves and two smaller open shelves that offer plenty of space for your cable box, DVD or Blu-ray player, and video game consoles. The back of this TV stand has an opening to run cables through, so you don’t have to worry about hiding all those messy wires and cables. The Altra Carson 50” TV Stand can hold a TV up to 50”, giving you room for a sizeable TV in addition to all the storage space. This cheap TV stand comes in a few different colors, including black, cherry, espresso, and Sonoma oak. All of these colors are beautiful, and this particular TV stand is made of real wood, making it look much more expensive than it really is. Last on our list of the best cheap TV stands is the Sauder Harvest Mill Panel TV Stand. This TV stand has a more traditional look than most of the other cheap TV stands we’ve reviewed. There are two enclosed compartments with doors on the front perfect for hiding your DVD, Blu-ray, or video game collection. Two smaller open compartments on the top of the TV stand are perfect for holding AV components such as your cable box, DVD or Blu-ray players, and video game consoles. The entire TV stand is made of oak wood with an abbey oak finish. This makes it look and feel much more expensive than other cheap TV stands, while still maintaining an affordable price tag. The Sauder Harvest Mill Panel TV Stand will last longer than most other cheap TV stands, too, thanks to its solid construction. While this TV stand can hold more weight than some other cheap TV stands, it only has enough space for a 42” flat screen TV. 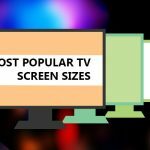 This is a decent size, but many households today have TVs that are significantly larger than this. 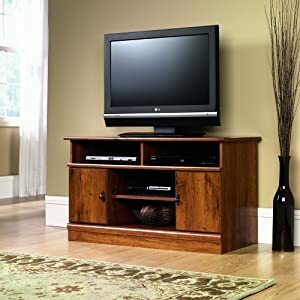 Overall, if you’re looking for a cheap TV stand that has a high quality look and feel and is sure to last for years to come, this TV stand is an excellent choice. If you’re not sure if any of the TV stands listed above are right for you, don’t worry. There are tons of ways to find even cheaper TV stands. 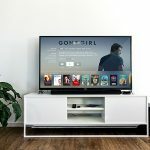 Whatever style or type of TV stand you’re looking for, you can find something in your price range online or in a store near you if you know when and where to look. All you have to do is put in a little bit of time and effort, and you can find a cheap TV stand that you’ll love. One of the best ways to get any piece of furniture at a deep discount is to browse local for-sale ads. There are bound to be tons of people in your area selling their old TV stands for far less than what they paid. You may have to search around a bit to find the right one, however. Some cheap TV stands found in local ads may be in poor condition, old, or simply not your style. With a little bit of searching, however, you’re bound to find something that’s inexpensive and works for you. Keep in mind that you can always buy and fix up an older TV stand. Whether that means fixing a few scratches and dents or giving an old TV stand a fresh coat of paint, it’s easy to restore older furniture and create something one-of-a-kind for your home. The holidays can be a great time to purchase a cheap TV stand. In fact, stores count on holiday sales to keep them going for the rest of the year. This means they’re desperate to sell during the holidays. Your best bet is to check out Black Friday sales. Many stores offer huge discounts on Black Friday, the day after Thanksgiving. This day kicks off the holiday shopping season and usually comes with big sales. If you don’t find the right TV stand on Black Friday, don’t worry—there are great holiday sales throughout the entire season. There are also bound to be good deals on Cyber Monday, the Monday after Thanksgiving. This is when shoppers tend to go online and start searching for holiday gifts. Many online stores, such as Amazon, take advantage of this surge in traffic and offer great deals you won’t see any other day of the year. One of the easiest ways to get anything cheap is to check out a second-hand or thrift store. Stores like Goodwill re-sell items donated by the public in order to get funds for charity work. Many other second-hand stores operate on a similar model. Because these stores aren’t looking to make a profit, everything is sold for just a fraction of its original price. For-profit thrift stores are also a great option. You can find unique items and you’re sure to pay far less than at a traditional furniture store. While some second-hand furniture might not be in like-new condition, you can find many pieces that are in good condition or just need a few repairs to be perfect. Even regular retail stores have big sales, and not just during the holidays. Look for going out of business sales, clearance sales, or post-holiday sales where stores are trying to get rid of extra merchandise. Some big box stores, such as Wal-Mart, offer great deals on a regular basis all year long. Keep up to date on when stores near you are having sales and buy when prices are low. 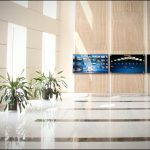 While a TV stand is an important part of your living room, most people don’t want to spend a fortune on a relatively small piece of furniture. Cheap TV stands are fairly easy to find, and there are many affordable options out there if you know where to look. 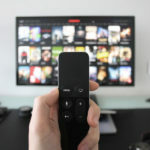 Whether you want a brand new TV stand or you’re willing to search through second-hand stores to find the perfect cheap TV stand for your home, you can get a great TV stand without breaking the bank.